Air Force Office of Special Investigations (OSI) - OSI provides professional investigative service to commanders of all Air Force activities. Its primary responsibilities are criminal investigations and counterintelligence services. Army Lawyer - Published by Judge Advocate General's Legal Center & School (JAGS), U.S. Army, Charlottesville, Virginia. Originally begun in August 1971 as a Department of the Army Pamphlet series (DA PAM 27-50), the publication has been issued monthly since 1974. It is intended primarily for the official use of Army lawyers in the performance of their legal responsibilities. Article 32 Investigations - The Fifth Amendment constitutional right to grand jury indictment is expressly inapplicable to the Armed Forces. In its absence, Article 32 of the Uniform Code of Military Justice (Section 832 of Title 10, United States Code), requires a thorough and impartial investigation of charges and specifications before they may be referred to a general court-martial (the most serious level of courts-martial). However, the accused may waive the Article 32 investigation requirement. The purpose of this pretrial investigation is to inquire into the truth of the matter set forth in the charges, to consider the form of the charges, and to secure information to determine what disposition should be made of the case in the interest of justice and discipline. Authorization for Use of Military Force (Enrolled Bill - S.J.Res.23) - A joint resolution passed by the United States Congress on September 14, 2001, authorizing the use of United States Armed Forces against those responsible for the attacks on September 11, 2001. The authorization granted the President the authority to use all "necessary and appropriate force" against those whom he determined "planned, authorized, committed or aided" the September 11th attacks, or who harbored said persons or groups. The AUMF was signed by President George W. Bush on September 18, 2001. Also see Wikipedia. Background Paper on Geneva Conventions and Persons Held by U.S. Forces - Human Rights Watch backgrounder (2002). Board of Veterans' Appeals (BVA) - Members of the Board review benefit claims determinations made by local VA offices and issue decision on appeals. Crimes of War - A unique collaboration of leading scholars, journalists, writers, and legal experts on war crimes, crimes against humanity, genocide, and international law as it is developing to confront these atrocities and the social and political crises they engender. Defense Link - Official website of the DoD with links to all government web sites, defense agencies, organizations and fact files. DOD Directive 1344.10 (02 Aug 04) - Covers regulations concerning political activities by members of the U.S. armed forces on active duty. International and Operational Law Practice: Navy JAG - Provides legal services in international agreements, negotiations and programs; air and space law; arms control initiatives; counter-drug operations; foreign criminal jurisdiction; and international maritime environmental law issues affecting U.S. Navy and Department of Defense interests. International Military Tribunal - Nuremberg - The Nizkor Project. JAG - Judge Advocate General's Corps (JAGC) is the Army's source of legal support to operations. Maritime Claims Reference Manual (23 June 2005) - DoD publication providing a general reference concerning maritime claims of all coastal nations. Provided for use by all elements of the Department of Defense. Military Law and Legal Links - A compilation. Military Law Review - The premier U.S. Armed Forces journal of military legal scholarship. It has been published quarterly by The Judge Advocate General's Legal Center & School (JAGS), U.S. Army, Charlottesville, Virginia since 1958. The Review is designed for use by military attorneys in connection with their official duties. Military Law: An Overview - From LII. National Institute of Military Justice - News, research tools, practioners, publications. Nuremburg War Crimes Trials - The Avalon Project at Yale Law School. Posse Comitatus Act - The United States federal law (18 U.S.C. § 1385, original at 20 Stat. 152) that was passed on June 18, 1878, after the end of Reconstruction and was updated in 1981. Its intent (in concert with the Insurrection Act of 1807) was to limit the powers of Federal government in using federal military personnel to enforce the State laws. The Bill/Act as modified in 1981 refers to the Armed Forces of the United States. It does not apply to the National Guard under state authority from acting in a law enforcement capacity within its home state or in an adjacent state if invited by that state's governor. The U.S. Coast Guard, which operates under the Department of Homeland Security, is also not covered by the Posse Comitatus Act, primarily because the Coast Guard has both a maritime law enforcement mission and a federal regulatory agency mission. Procedural Guide for Article 32(b) Investigating Officer (U.S. Army) - This guide is published for use by officers who have been appointed as investigating officers under article 32(b) of the Uniform Code of Military Justice (UCMJ). This guide should be used in conjunction with the DD Form 457 (Investigating Officer's Report) and the applicable Rules for Courts-Martial (R.C.M.) in the Manual for Courts-Martial, United States, 1984 (hereafter referred to as MCM, 1984). The investigating officer's functions are: To make a thorough and impartial investigation into the truth of the allegations; to consider the correctness and the form of the charges; and to make recommendations as to the disposition of the charges in the interest of justice and discipline. S.J.Res. 23 (107th): Authorization for Use of Military Force - Authorizes the president to "use all necessary and appropriate force against those nations, organizations, or persons he determines planned, authorized, committed, or aided the terrorist attacks that occurred on September 11, 2001, or harbored such organizations or persons, in order to prevent any future acts of international terrorism against the United States by such nations, organizations or persons." Staff Judge Advocate to the Commandant of the U.S. Marine Corps - A central source for Marine Corp legal information. Terrorism and the Law of War: Trying Terrorists as War Criminals Before Military Commissions (12/11/01) [.pdf] - Congressional Research Service. Tribunal Forum - FindLaw's Writ columnists discuss the use of military tribunals to try suspected terrorists. U.S. Air Force Court of Criminal Appeals - Information regarding cases presently before the Court, the Court's rules, review the Court's published opinions and memorandums of opinions, current calendar of the Court, and additional links. U.S. Army Criminal Investigation Command (CID) - Responsible for the conduct of criminal investigations in which the Army is, or may be, a party of interest. U.S. Code Search - Provided by the Office of Law Revision Counsel. U.S. Court of Appeals for the Armed Forces (CAAF) - The United States Court of Military Appeals, which was redesignated on October 5, 1994, as the United States Court of Appeals for the Armed Forces by the National Defense Authorization Act for 1995, Pub. L. No. 103-337, was created by Congress in the Uniform Code of Military Justice (UCMJ), enacted on May 5, 1950. Thus, this Federal Court is established under Article I of the Constitution which gives to Congress the power to make rules for the government and regulation of the armed forces. 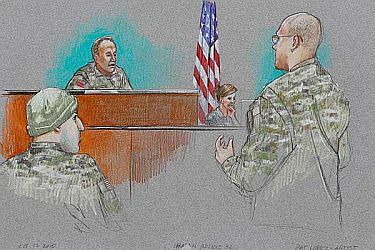 Since its establishment in 1951, the United States Court of Appeals for the Armed Forces has reviewed more than 78,000 cases and has published more than 6,500 opinions. See Opinons & Digests. U.S. Military Commissions: A Quick Guide to Available Resources - By Stephen Young. U.S. Navy Judge Advocate General's Corps - Unclassified documents. U.S. President Issues Military Order (13 Nov 01) - Detention, Treatment, and Trial of Certain Non-Citizens in the War Against Terrorism. War Powers Act of 1973 - A federal law intended to check the power of the President in committing the United States to an armed conflict without the consent of Congress. This webpage last updated on Monday, March 6, 2017 8:59 AM.